This plant maybe erect or spreading and often grows to about to cm tall. 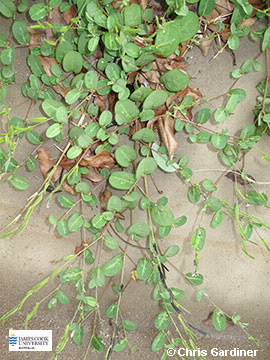 Leaves are lanceolate, 5-50 mm long and up to 20 mm wide; stipules are prominent, papery 5-12 mm long. The pea-shaped flowers are borne in pairs in a dense raceme. Standard petal is pink and about 5 mm long, wings are orange to purple, colour of keel is variable. Pod 5-25 mm long breaks up at maturity into 2-7 segments, each dark-brown segment is covered with short hooked hairs, seeds are yellowish.